MOUNT VERNON, Iowa — The Lawrence University volleyball team saw its hopes of a Midwest Conference Tournament title dashed Friday after an impressive performance by defending league champion Cornell College. The Rams defeated Lawrence 25-15, 25-15, 25-9 in the tournament semifinals. League player of the year Diamond Boyd and Nicole Ciari paced Cornell (22-6) with nine kills apiece. The Rams hit .351 for the match and had just eight attack errors. Freshman Rachel Barthel paced Lawrence (11-16) with seven kills, and Arianna Neumeyer added six kills and 10 digs. Sydney Nelson led Lawrence with 10 assists, and Barthel picked up seven digs and a pair of aces. Cornell jumped out to a 10-5 lead in the opening set and gradually pulled away. In the second set, Lawrence led 14-13 after a kill by Barthel, but the Rams went on a 12-1 run to finish the set. Cornell raced to a 10-2 lead in the third set and quickly closed out the set and the match. APPLETON, Wis. — Lawrence University volleyball standouts Arianna Neumeyer and Cyra Bammer have been chosen for the All-Midwest Conference team in a vote of league coaches. 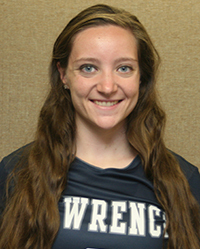 Neumeyer (Manitowoc, Wis./Lutheran), a sophomore outside hitter, was named to the first team. Bammer (Zionsville, Ind./Zionsville), the team’s libero, was a second-team pick. Neumeyer, who was chosen for the second consecutive year, was the Vikings’ top hitter and a force on the serve and on defense. Neumeyer piled up 258 kills for an average of 3.11 per set while posting a .140 hitting percentage. Neumeyer, who earned MWC Offensive Player of the Week honors during the season, also picked up 26 service aces. Neumeyer was second on the team in digs only to Bammer and finished with 298 during the regular season for an average of 3.59 per set. Neumeyer also was second on the team with 27 blocks. Bammer, who was twice named the MWC Defensive Player of the Week this season, led the team with 433 digs this season. Bammer, who passed 1,000 career digs this season, averaged 5.41 digs per set. Bammer also contributed 19 aces, 34 kills and 48 assists. 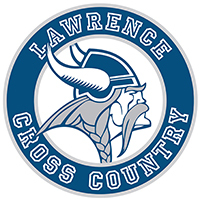 Lawrence also won the Sportsmanship Award in a vote by the league’s coaches. APPLETON, Wis. — It was the most important match of the season for the Lawrence University volleyball team, and it was one in which the Vikings weren’t playing. When St. Norbert knocked off Ripon on Oct. 26, it vaulted Lawrence into the four-team Midwest Conference Tournament in Mount Vernon, Iowa. Lawrence plays top seed Cornell Friday night in one semifinal, and St. Norbert faces Grinnell in the other. The winners meet Saturday in the title match with a NCAA Division III Tournament berth on the line. Lawrence (11-15) has been knocking on the door of the tournament since 2013 and narrowly missed making it last season. The Vikings returned all-conference hitter Arianna Neumeyer, the setting duo of Lauren Ray and Sydney Nelson and defensive standout Cyra Bammer. A valuable new addition to the mix has been rookie outside hitter Rachel Barthel. The Vikings stumbled out of the gate with an 0-2 conference mark, but then reeled off five straight conference wins. Road losses at Grinnell and Cornell to finish the league slate put their tournament berth in jeopardy before they got the assist from St. Norbert. It’s Lawrence’s first berth in the MWC Tournament since it went to its current four-team format in 2008. Just making the tournament isn’t enough for Schoultz and the Vikings. They would like to win a match or two, but the Vikings will have to knock off four-time defending champion Cornell to get to the title match. It would be a first for Lawrence volleyball, and Schoultz would like to add “2016” to the volleyball banner in Alexander Gymnasium. “Every day we step in that gym and we have an empty banner up there. It’s hard not to think about that every day in practice,” Schoultz said. APPLETON, Wis. — The Lawrence University volleyball team gears up for the Midwest Conference Tournament this week, and hockey looks to win the Battle of Highway 41 trophy in a busy week for the Vikings. When and Where: Friday, Nov. 4, 7 p.m., Blue Line Ice Center, Fond du Lac, Wis., and Saturday, Nov. 5, 7 p.m., Appleton Family Ice Center. Series: Marian holds a 52-16-6 lead in the series, which started in the 1992-93 season. Lawrence has fared better against the Sabres in the last three seasons with a 2-4-0 mark. Fast Fact: Lawrence took No. 1 UW-Stevens Point to overtime before falling 3-2 this past Saturday. The Vikings’ win over No. 2 St. Norbert in the 2013-14 season remains the highest-ranked opponent the Vikings have defeated. The Vikings are playing for the Battle of Highway 41 trophy this weekend with the Sabres. Marian has a 6-1 edge in the series and currently has possession of the trophy after winning in a shootout after the teams split the games in 2015-16. When and Where: Friday and Saturday, Nov. 4-5, Small Center, Mount Vernon, Iowa. Semifinals Friday, Lawrence at Cornell (21-6), 7 p.m., St. Norbert (14-14) vs. Grinnell (14-10), 4:30 p.m. Championship Saturday, 1 p.m.
Series: Cornell holds a 5-2 edge in a series that started during the 2000 season. Fast Fact: This is Lawrence’s first trip to the Midwest Conference Tournament since it went to its current four-team format for the 2008 season. The Vikings finished in a tie for fourth place in the standings but won a tiebreaker with Ripon to knock the Red Hawks out. An automatic berth in the NCAA Division III Tournament goes to the tournament winner this weekend. When and Where: Saturday, Nov. 5, 8 a.m., UW Natatorium, Madison, Wis.
Fast Fact: This is the season opener for the Lawrence fencing team, and it’s the debut for new head coach Michael Hall. Hall was hired as the team’s full-time head coach recently and replaces Steve Amich, who had served as the team’s coach for most of the past two decades. When and Where: Saturday, Nov. 5, 1 p.m., The Knox Bowl, Galesburg, Ill.
Series: In a series that goes back to 1935, Lawrence holds a 36-23-2 advantage over the Prairie Fire. The Vikings hold an 8-5 edge in the series since the 2003 season, but Knox has won the last two meetings. Lawrence has scored more than 60 points twice against Knox. 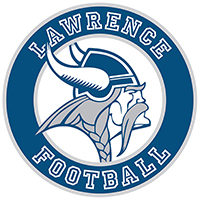 The Vikings posted a school-record 67 points against Knox back in 1981 and scored 62 at Knox in 2011 in a game that featured a Lawrence record 573 passing yards. Fast Fact: Lawrence put up some big numbers against Grinnell this past Saturday as the Vikings rolled up 622 yards on offense, just 47 shy of the school record of 669. Lawrence also had 442 rushing yards, just 46 yards away from the record of 488. Rookie quarterback Philip Santiago and rookie running back Wasonu Allen both went over 100 rushing yards. Allen had a team-high 146 on just eight carries, and Santiago had 140 on six attempts. Three of Santiago’s seven pass completions went for touchdowns. When and Where: Saturday, Nov. 5, 1 p.m., Boldt Natatorium. Fast Fact: Lawrence split its first dual meet of the season this past weekend against Ripon. 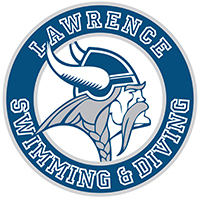 The Lawrence women rolled to an impressive victory, and the Viking men were edged by the Red Hawks. Danielle Millin led the Vikings by winning a pair of events and swimming on a winning relay. PLYMOUTH, Wis. — The Lawrence University volleyball team played some stingy defense Saturday and rode that to a 3-0 nonconference win over Lakeland University at Woltzen Gymnasium. Lawrence won the match 25-21, 25-22, 25-21 as part of the Lakeland Quadrangular. 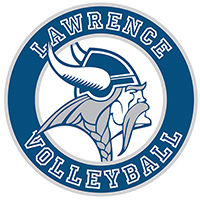 Lawrence (11-15) limited Lakeland (15-16) to a .055 hitting percentage for the match and piled up 55 digs. Cyra Bammer and Katie Kumbalek had 14 digs apiece to pace the Vikings. Arianna Neumeyer led Lawrence with nine kills and picked up 10 digs. Rachael Wuensch added eight kills for the Vikings, and Lauren Ray posted 17 assists. Bammer had a team-best three aces, and Ray picked up a pair. PLYMOUTH, Wis. — The Edgewood College volleyball team downed Lawrence University 3-0 in a nonconference match on Saturday at Woltzen Gymnasium. The Eagles won 25-17, 29-27, 25-15 as part of the Lakeland College Quadrangular. Emily Chaussee led Edgewood (17-13) with 10 kills. Arianna Neumeyer paced the Vikings (10-15) with nine kills and 11 digs, and Rachel Barthel added eight kills. Lauren Ray picked up 10 assists for the Vikings. APPLETON, Wis. — A trio of fall teams wrap up the regular season this week, and the Lawrence University volleyball team will have to wait to determine its fate on earning a berth in the Midwest Conference Tournament. When and Where: Tuesday, Oct. 25, 7 p.m., Ron Roberts Field at the Banta Bowl. 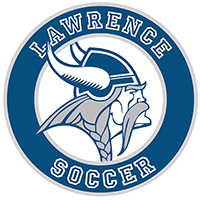 Series: Lawrence has a 32-17-2 advantage in a series that started in the Vikings’ first season of soccer, 1974. The Vikings have won three straight and are 10-3-2 in their last 15 games against the Red Hawks. When and Where: Saturday, Oct. 29, noon, Strong Stadium Complex, Beloit, Wis.
Series: Beloit has a 28-20-2 lead in the series that dates back to 1974. Lawrence has won four straight over the Bucs, and the Vikings have a 7-1-1 mark in their last nine games against Beloit. Fast Fact: Lawrence sophomore Taylor Reifert has at least one point in five of his last six games. He took over the team scoring lead with a goal against Monmouth this past Saturday and now has seven this season. When and Where: Wednesday, Oct. 26, 7 p.m., Ron Roberts Field at the Banta Bowl. Series: In a series that stretches back to 1982, Lawrence has a 29-16-1 lead in the rivalry. The Vikings have won two of the last three games and own a 14-3-1 mark against the Red Hawks since the 1998 season. When and Where: Saturday, Oct. 29, 2:30 p.m., Strong Stadium Complex, Beloit, Wis.
Series: Beloit owns a 22-18-7 edge in a series that dates back to 1982. Beloit’s win last season snapped Lawrence’s five-game unbeaten streak (4-0-1) in the rivalry. Fast Fact: Ryan Berkley scored her team-leading third goal of the season against North Park last Friday. When and Where: Friday, Oct. 28, 7 p.m., Hobbs Ice Center, Eau Claire, Wis.
Series: UW-Eau Claire holds a 8-1-0 lead in a series that started in the 2000-01 season. Lawrence picked up a victory against the Blugolds during the 2009-10 season. When and Where: Saturday, Oct. 29, 7 p.m., Willett Arena, Stevens Point, Wis.
Series: UW-Stevens Point holds a 7-1-0 lead in a series that started in the 2002-03 season. The Vikings topped the Pointers 5-4 in the 2010-11 season. Fast Fact: Lawrence opens its 31st hockey season with a pair of ranked opponents, including the top-ranked Pointers. UW-Stevens Point won its fifth NCAA Division III championship with a 5-1 victory over St. Norbert last season. When and Where: Saturday, Oct. 29, 11 a.m., The Beloit Club, Beloit, Wis.
Fast Fact: The Lawrence men are serious Midwest Conference title contenders but will have to fight it out with Grinnell and Lake Forest. The Pioneers have won the last four league titles and are the favorite again on Saturday. Lawrence standout Josh Janusiak owns the league’s fastest time this season, and is supported by freshman sensation Joe Kortenhof and returning all-conference performers Max Edwards and Ben Schaefer. When and Where: Saturday, Oct. 29, 1 p.m., Woltzen Gymnasium, Plymouth, Wis.
Series: Lawrence holds an 8-7 edge over the Eagles since 2000, but Edgewood has won seven in a row against the Vikings. When and Where: Saturday, Oct. 29, 3 p.m., Woltzen Gymnasium, Plymouth, Wis.
Series: Lakeland has a 27-8 advantage in a series that dates back to 1980. The teams have split the last four meetings, with Lawrence winning in 2010 and 2011, and Lakeland posting victories in 2013 and 2015. Fast Fact: All eyes for the Vikings will be on the Ripon-St. Norbert match on Wednesday night. Should the Green Knights knock off Ripon in the Midwest Conference finale for the Red Hawks, that would give Ripon four league losses. Lawrence also has four losses in conference play, but the Vikings hold the tiebreaker over Ripon and that might mean a Midwest Conference Tournament berth for Lawrence. Series: In a series that goes back to 1940, Grinnell holds a 31-27 lead based on the strength of the Pioneers’ current five-game win streak in the rivalry. Grinnell is only halfway to the longest win streak in the series. Lawrence won 10 straight from 1941-54. Fast Fact: Lawrence plays its final home game of the season on Saturday with seven seniors trotting onto Ron Roberts Field at the Banta Bowl for the final time. Receiver Trevor Spina and tackle Jackson Straughn represent seniors on the offense, linebacker Jake Lueck (currently out due to injury), safety Wes Hetcher, lineman Josh Mosley and cornerback Nick Ulloa represent the defense. Kicker Pat O’Mahoney is the Vikings’ senior placekicker. When and Where: Saturday, Oct. 29, 1 p.m., Boldt Natatorium. Fast Fact: Lawrence opened its season at the massive All-Wisconsin Showcase last weekend and faced top competition from the state’s NCAA Division I programs and schools from the Wisconsin Intercollegiate Athletic Conference. Paige Witter and Emei Thompson posted the best finishes for the Vikings as Witter was 10th in the 200-yard butterfly and Thompson was 10th in the 500 freestyle. MOUNT VERNON, Iowa — The Cornell College volleyball team won a pair of tight sets Saturday and went on to a 3-0 Midwest Conference victory over Lawrence University. The Rams won 25-21, 25-15, 25-23. Diamond Boyd led Cornell (17-6, 9-0 MWC), which won the league title, with 17 kills, and Libby Schnoor added 10. Katherine Devlin picked up 34 assists for the Rams. Arianna Neumeyer paced Lawrence (10-14, 5-4) with nine kills, and Rachael Wuensch added six. Sydney Nelson picked up 21 assists, and Cyra Bammer had 23 digs. The Rams pulled out to a 20-10 lead in the first set before the Vikings rallied. The Vikings were still down 24-15 when they rattled off six consecutive points, including two kills by Neumeyer and an ace from Nelson, to cut the margin to 24-21. The Rams finally ended the first set on Schnoor’s kill. After Cornell won the second set, the third set was tight throughout. The set was tied at 23-23 after Sara Schliesman’s kill, but a kill by Boyd and a Lawrence attack error gave the Rams the set and match. GRINNELL, Iowa — The Grinnell College volleyball team won a pair of tight opening sets Friday and went on to a 3-1 Midwest Conference victory over Lawrence University at Darby Gymnasium. Grinnell won 25-23, 25-22, 15-25, 25-18. Olivia Fromm led Grinnell (12-9, 4-2 MWC). with 15 kills, and Margaret Giles picked up 32 assists. Arianna Neumeyer paced all players with 16 kills for Lawrence (10-13, 5-3), and Rachel Barthel added 13. Cyra Bammer led Lawrence with 37 digs, and Neumeyer picked up 21 digs and three aces. Sydney Nelson paced the Vikings with 16 assists. The first set was tied at 22-22, but a Grinnell kill and a Lawrence error gave the Pioneers a two-point edge. Neumeyer countered with a kill for the Vikings, but Grinnell got a kill from Ariel Lepito to close out the set. Lawrence trailed 21-12 in the second set before rallying. The Vikings went on a 10-2 run, capped by Lauren Ray’s ace, to cut the lead to 24-22. Emily Friedman countered with a kill to give Grinnell a 2-0 lead. Lawrence dominated the third set and cruised to an easy victory, but Grinnell pulled away midway through the fourth set for a 17-10 lead. The Vikings bounced back and cut the margin to 24-18 before a Lawrence service error gave Grinnell the set and match. 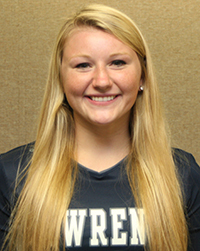 APPLETON, Wis. — The Lawrence University volleyball team swept the Midwest Conference Player of the Week awards after winning a trio of league matches. Sophomore outside hitter Arianna Neumeyer (Manitowoc, Wis./Lutheran) was named the Offensive Player of the Week, and junior defensive specialist Cyra Bammer (Zionsville, Ind./Zionsville) was named Defensive Player of the Week for the second consecutive week. Lawrence was perfect on the week as the Vikings won at Beloit College and knocked off Lake Forest College and Ripon College at Alexander Gymnasium. The Vikings have now won five straight to improve to 5-2 in the league and 10-12 overall. Neumeyer piled up 49 kills for the week as the Vikings topped Beloit in straight sets and defeated both Lake Forest and Ripon in four sets. Neumeyer had a .289 hitting percentage for the three matches in addition to collecting six aces, 40 digs and a pair of blocks. Neumeyer started her week with a match-high nine kills and 11 digs as the Vikings rolled past Beloit. She then picked up 18 kills, two aces and 11 digs in Lawrence’s win over Lake Forest. Neumeyer finished the week by matching her career high with 22 kills to go along with four aces and 18 digs in a victory over Ripon. Bammer collected 61 digs on her way to winning the weekly award for the second straight time. Bammer picked up 18 digs in the Vikings’ win over Beloit. She then had 15 digs against Lake Forest and finished the week with 28 digs against Ripon. For the week, Bammer and the Vikings limited the opposition to a .095 hitting percentage. Lawrence returns to action this weekend for a pair of conference matches in Iowa. The Vikings play at Grinnell College on Friday before heading to Cornell College for a Saturday morning match.